The London Docklands bombing (also known as the Canary Wharf bombing or South Quay bombing) occurred on 9 February 1996, when the Provisional Irish Republican Army (IRA) detonated a powerful truck bomb in Canary Wharf, one of the two financial districts of London. The blast devastated a wide area and caused an estimated £100 million worth of damage. Although the IRA had sent warnings 90 minutes beforehand, the area was not fully evacuated; two people were killed and 39 were injured. Since the beginning of its campaign in the early 1970s, the IRA had carried out many bomb attacks in England. As well as attacking military and political targets, it also bombed infrastructure and commercial targets. The goal was to damage the economy and cause disruption, which would put pressure on the British government to negotiate a withdrawal from Northern Ireland. In the early 1990s, the IRA began another major bombing campaign in England. In February 1991 it launched a mortar attack on 10 Downing Street, headquarters of the British government, while Prime Minister John Major was holding a meeting. The mortars narrowly missed the building and there were no casualties. In April 1992, the IRA detonated a powerful truck bomb at the Baltic Exchange in the City of London, its main financial district. The blast killed three people and caused £800 million worth of damage; more than the total damage caused by all IRA bombings before it. In November 1992, the IRA planted a large van bomb at Canary Wharf, London’s second financial district. However, security guards immediately alerted the police and the bomb was defused. 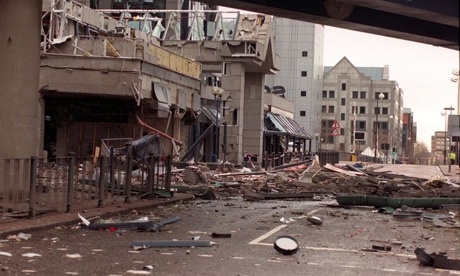 In April 1993 the IRA detonated another powerful truck bomb in the City of London. It killed one person and caused £500 million worth of damage. In December 1993 the British and Irish governments issued the Downing Street Declaration. It allowed Sinn Féin, the political party associated with the IRA, to participate in all-party peace negotiations on condition that the IRA called a ceasefire. The IRA called a ceasefire on 31 August 1994. Over the next seventeen months there were a number of meetings between representatives of the British government and Sinn Féin. There were also talks—among the British and Irish governments and the Northern Ireland parties—about how all-party peace negotiations could take place. By 1996, John Major’s government had lost its majority in the British parliament and was depending on Ulster unionist votes to stay in power. It was accused of pro-unionist bias as a result. The British government began insisting that the IRA must fully disarm before Sinn Féin would be allowed to take part in full-fledged peace talks. The IRA rejected this, seeing it as a demand for total surrender. Sinn Féin said that the IRA would not disarm before talks, but that it would discuss disarmament as part of an overall solution. On 23 January 1996, the international commission for disarmament in Northern Ireland recommended that Britain drop its demand, suggesting that disarmament begin during talks rather than before. The British government refused to drop its demand. At about 19:01 on 9 February, the IRA detonated a large bomb containing 500 kg of ammonium nitrate fertilizer and sugar, in a small lorry about 80 yards (70 m) from South Quay Station on the Docklands Light Railway (in the Canary Wharf area of London), directly under the point where the tracks cross Marsh Wall. The detonating cord was made of semtex, PETN and RDX high explosives. The IRA had sent telephoned warnings 90 minutes beforehand, and the area was evacuated. However, two men working in the newsagents shop directly opposite the explosion, Inam Bashir (29) and John Jeffries (31), had not been evacuated in time and were killed in the explosion. 39 people required hospital treatment due to blast injuries and falling glass. Part of the South Quay Plaza was destroyed. The explosion left a crater ten metres wide and three metres deep. The shockwave from the blast caused windows as far east as Barking, approximately five miles away, to rattle. Killed in lorry bomb explosion, left in car park, South Quay railway station, Isle of Dogs, London. Inadequate warning given. Approximately £100 million worth of damage was done by the blast. Three nearby buildings (the Midland Bank building, South Quay Plaza I and II) were severely damaged (the latter two requiring complete rebuilding whilst the former was beyond economic repair and was demolished). The station itself was extensively damaged, but both it and the bridge under which the bomb was exploded were reopened within weeks (on 22 April), the latter requiring only cosmetic repairs despite its proximity to the blast. This bomb represented the end to the IRA ceasefire during the Northern Ireland peace process at the time. James McArdle was convicted of conspiracy to cause explosions, and sentenced to 25 years in prison, but murder charges were dropped. McArdle was released under the terms of the Good Friday Agreement in June 2000 with a royal prerogative of mercy from Queen Elizabeth II. On 28 February, John Major, the Prime Minister of the United Kingdom, and John Bruton, the Taoiseach of the Republic of Ireland, announced that all-party talks would be resumed in June. Major’s decision to drop the demand for IRA decommissioning of weapons before Sinn Fein would be allowed into talks led to criticism from the press, which accused him of being “bombed to the table”. My blog and Twitter account are dedicated to remembering all innocent victims of the Northern Ireland Troubles and all those killed by terrorists across the globe. Have a little look around , you might find something of interest. Please take the time to follow me on Twitter @bfchild66 and sign up for my blog by clicking the follow button at the bottom of this page , or any page for that matter.